Well, either you like it or you don't - and it's the best way I can describe this boat-paddle design! 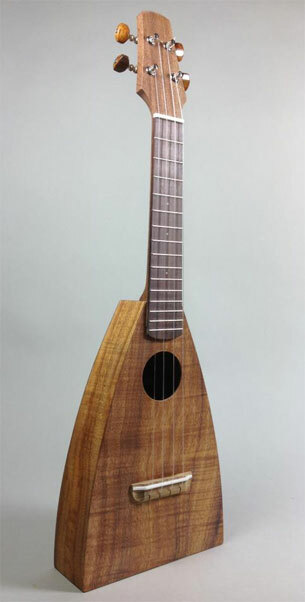 It is a great sounding instrument, hand made in slightly curly koa and other exoric woods. Designed as a teaching piece, the same degree of care and attention that goes into my bespoke commissions is lavished on this budget instrument. It has a hand rubbed oil finish and is fitted with Aquila Nylgut strings tensioned with geared tuners. However, no description can really describe how great this instrument is, so view this video to make up your own mind. For prices, please see my Shop & Prices page. If you are interested in puchasing one of my marmite ukuleles, or have a question you would like to ask, please just get in touch.